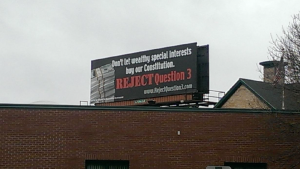 RenewRI, the pro-Constitutional Convention coalition, filed a complaint with the Rhode Island Board of Elections this morning, listing violations of Rhode Island election laws for two billboards, two internet web pages, and an Internet video published by Citizens for Responsible Government (CFRG) and their twenty-one coalition members who oppose a constitutional convention. The billboards were posted the first week of October, and the Internet video first appeared on September 28th. In the complaint RenewRI details how the CFRG has flouted Rhode Island laws that protect voters’ right to know who is funding ballot advocacy campaigns. The Providence Journal reported on the filing of the complaint the same day and Tim Murphy, a RenewRi member, followed up with an op-ed published in the Providence Journal the following day. On October 28, Richard Thornton from the Rhode Island Board of Elections agreed to hold a hearing regarding the complaint on October 30 at 2:15 pm. That’s a remarkably quick turnaround (two days), but the close of the polls was only five days away and voting had already begun. Enforcement of election laws during the last week of a campaign is a chronic problem because there isn’t time to research violations and the post-election sanctions are often inadequate to deter violations. This is especially a problem for constitutional convention referendums. The committees that fund such elections can disband immediately after and since such a referendum is essentially a one-time event—there is no future election or political career, such as with a candidate election—the practical possibilities for deterrence are weak. In America, the primary deterrent for violating the laws of politics is the political process, not the courts. Not only are courts very slow and expensive, but we generally want to keep courts as far removed as possible from making political decisions–unless they can rely on bright line rules. Near the end of an election cycle, the primary job of the Board of Elections is to ferret out the facts in a timely way so the public can make its own judgment. J.H. Snider and Beverly Clay wrote about Rhode Island’s poor history of enforcing campaign finance laws with regard to the constitutional convention referendum in an op-ed published in the Providence Journal earlier this year. For additional details, see the documents we posted here on RhodeIslandConCon.info concerning the 2004 constitutional convention referendum. Tim Murphy’s op-ed adds to that historical analysis while also covering the current election. On October 30, 2014, the Board of Elections held a public hearing on the RenewRI complaint. The result of the hearing was that the Board of Elections agreed with 17 of 22 alleged violations and issued a warning to The Coalition for Responsible Government, which said it had already addressed most of the complaints but that its billboard could not be fixed in as timely a manner because its printer was in Colorado. RenewRI claimed that the Coalition’s video still had not been fixed. By 11:00 pm on October 31, the video was fixed, with the view count reset to zero. The Coalition for Responsible Government appears to have been better represented than RenewRI. It had a lawyer; RenewRI did not. One participant at the hearing had the impression that questions from the Executive Director of the Board of Elections to the defendants indicated that a Coalition representative had privately made the Coalition’s case to the Board of Elections prior to the hearing. We are not aware that such behavior would be illegal in Rhode Island. Nevertheless, it would be striking behavior because in judicial proceedings conducted by the judicial branch of government a judge is not allowed to privately consult with counsel representing one of the two sides. In federal administrative proceedings, when an advocate lobbies a decision maker on an active proceeding, he must file an ex parte disclosing the time, place, and subject matter of the meeting with the decision maker. As of 4:00 pm on Friday, the Board of Elections had not posted either minutes or the audio recording of yesterday’s meeting, so confirming details as to what happened was difficult. A call to the Executive Director late Friday afternoon indicated that minutes wouldn’t be available before the election. The audio recording would be made available upon request but could not be requested from the person responsible for them until Monday (one day before the election) at the earliest. The lack of timely access to webcasts of its public hearing is a great problem because enforcement of campaign finance laws primarily relies on public opinion. If the public lacks timely access to relevant evidence because the Board of Elections uses archaic information systems that favor insiders, this would be inconsistent with the intent of the campaign finance laws, which is to implement the core democratic principle of political equality in an effective way. The Executive Director of the Board of Elections agreed that the Coalition for Responsible Government had failed to make legally required disclosures but criticized RenewRI for waiting until 10 days before the election before filing its complaint. The implication was that the delay was politically motivated. No explanation was provided as to why allowing misleading advertising that favored its opponent would be in RenewRI’s interest. The criticism revealed a vital insight into how the Board of Elections views its job. It doesn’t view its job as investigating violations of the law, only responding to complaints by interested parties who allege a violation of the law. An uniformed voter might presume that the Board of Elections would have an independent interest in ensuring that campaign finance disclosures were accurate, but they would be wrong. As a practical matter, it views researching violations as solely the duty of the citizenry; if the citizens don’t develop a well documented, professionally written complaint the moment they discover a potential violation and then seriatim for each successively found violation, it is the citizens’ fault when the law isn’t upheld by the Board of Elections. The Executive Director of the Board of Elections asked questions of the defendants but apparently didn’t ask them about their entity status, arguably the key question in the complaint because if RenewRI didn’t properly file as an entity, the scope of the proceeding would be greatly expanded and include a wh0-is-who of prominent Rhode Island Interest groups: the Coalition’s members. We don’t understand how the law would work if the Coalition for Responsible Government didn’t properly file as an entity. For example, the Coalition for Responsible Government must disclose the names of its contributors and the names of its five largest contributors on its mass media advertising such as billboards. But if it weren’t the entity, then its member entities would presumably have to disclose such information. This would probably be the subject of endless litigation stretching years into the future. Logistically, this could work for Board of Elections campaign finance filings but it’s not clear how it could work on something such as a billboard, where if dozens of organizations had to disclose their top five contributors the billboard could have no room for any other information. It could also reveal highly sensitive information. For example, the Rhode Island ACLU may receive a substantial fraction of its funding from its fellow Coalition members. Currently, the Coalition just lists the Rhode Island ACLU as one of its top five funders with the implication that its funding is independent of the other top four coalition members. After the 2004 referendum to convene a constitutional convention in Rhode Island, the Rhode Island Board of Elections sent a letter to the Rhode Island ACLU requesting that it make required disclosures. 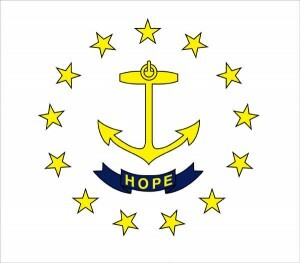 The Rhode Island ACLU had opposed the referendum as a member of the Coalition for Representative Government. In response, the Rhode Island ACLU sued the State of Rhode Island, arguing that it didn’t have to disclose its funders. The Providence Journal covered the hearing here. We expect to post future clarifications and updates on this issue on this page. After many calls to the Executive Director’s assistant on November 3 and November 4, she agreed to make a copy of the October 30 hearing available on Wednesday morning, November 5. It would be made available for pickup on a cassette tape, the type of music format that was popular in the 1960s though the 1980s. Thanks to Sandy Riojas, the vice president of Operation Clean Government, for promptly picking up the tape and mailing it to J.H. Snider. Fortunately, he had a high quality old-fashioned cassette player. But he found the voices on the cassette to be recorded at little more than a distant whisper, as though the cassette recorder was on one side of the room and the speakers far away and without microphones linked to the recorder. Through professional equipment the voices could presumably be amplified and thus make audible, but this additional level of required effort was too burdensome and so the effort to listen to the hearing was abandoned. Perhaps the Board of Elections is content not to have its meetings meaningfully public. If so, such behavior could conflict with one of its primary purposes, which is to educate the public about campaign finance disclosures in a timely and effective manner.